Carbon content is one of the most important parameters measured in various types of solutions, from commercial drinking water to industrial wastewater. Total organic carbon1 (TOC) analyzers are devices used to analyze the organic carbon content in these water or liquid solutions. They provide highly sensitive, non-specific readouts of all TOC through two-stage processes involving oxidation and detection. These devices are necessary to account for chemical solvents and bacteria that contaminate water solutions. This is important because of the harmful effects that TOCs may have on health and the environment. In analyzing a material that contains carbon, one must first understand the different types of carbon that may be present. Figure 1 shows a hierarchy of carbon types. Figure 1 – Breakdown of carbon types. In order to analyze a sample, TOC analyzers employ either differential or direct methods of measurement. In the differential method (also known as TC-IC), both total carbon (TC) and total inorganic carbon2 (TIC) may be determined by separate measurement and TOC may be calculated by subtracting TIC from TC. This method is suitable for samples in which TIC is less than or of similar size to TOC. In the direct method, TIC is removed from a sample by purging3 the acidified sample with a purified gas. TOC is then determined by oxidation. This method is also known as NPOC (non-purgeable organic carbon) due to the fact that POC (purgeable organic carbon) such as benzene, toluene, cyclohexane, and chloroform may be partly removed from a sample by gas stripping. The direct method is suitable for surface water, ground water, and drinking water because of (in most cases) less TOC than IC and a negligible amount of POC in these samples. When selecting a TOC analyzer, industrial buyers should focus on the analysis methods and performance specifications of the device. TOC analyzers can employ a number of different techniques for oxidation and detection of TOC. These methods generally have a specific analytical range and many have been officially standardized. The table below provides an overview of this information. All TOC analyzers offered today employ either combustion or low-temperature oxidation techniques. The purpose of the oxidation step is to convert the organics to carbon dioxide which can be measured by a detector to provide TOC values. Low-temperature oxidation is chemical oxidation aided by 100°C heat and either persulfate, UV irradiation and persulfate, or only UV irradiation. The low-temperature techniques have the advantage of allowing a large volume of sample to be analyzed, thereby improving the low limit of detection. Also, the blank value is very low as long as the reagents are pure, which makes the analysis more accurate. Ultraviolet irradiation uses ultra-violet light to oxidize the carbon present in the sample to produce carbon dioxide. UV oxidation is the most reliable, low maintenance method for TOC analysis of ultra-pure waters. Thermo-chemical (persulfate) oxidation, also called “heated persulfate”, uses the same free radical formation method as UV/persulfate oxidation, but also uses heat to magnify the oxidation power of persulfate. Unlike UV/persulfate, this method is not susceptible to lower recoveries resulting from turbidity in samples. TOC analyzers which incorporate thermo-chemical oxidation are useful in wastewater, drinking water, and pharmaceutical water analysis. When used with sensitive non-dispersive infrared (NDIR) cell detectors, these analyzers can readily measure TOC up to hundreds of ppm depending on samples volumes. UV/persulfate irradiation uses UV light for oxidation magnified by a chemical oxidizer (usually persulfate). TOC analyzers that use this oxidation method can measure levels of organic carbon as low as 200 parts per billion (ppb). High temperature combustion uses heat (680°C or higher) in a stream of air or pure oxygen and usually in the presence of a catalyst. The catalysts used are generally cupric oxide, cobalt oxide, or platinum on an alumina support. In the process, the oxygen-rich atmosphere converts all carbon to carbon dioxide to be measured. Most modern analyzers use NDIR to detect the carbon dioxide produced from combustion. Samples with less than 50 ppb TOC. UV or UV/persulfate provides the most trouble free operation and the ease of detecting very low level TOC. Samples with less than 500 ppb TOC. Combustion technology can measure in this range, but UV or UV/persulfate is still the easier method. For meeting precision and accuracy requirements, UV/persulfate is the better technology. Combustion should be used if capturing the particulated organic carbon as part of the TOC value is important. Combustion technology is not affected by chlorides present in seawater and other salty matrixes. Combustion technology was designed to handle particulates, chlorides, and tough to oxidize compounds typical of industrial waste. Out of all components of a TOC analyzer, accurate detection and quantification are considered the most vital. Detection techniques include conductivity cells and non-dispersive infrared cells. Conductivity cells rely on aqueous CO2 to raise acidity levels, causing the conductivity of the solution to increase. TOC analyzers that use a conductometric method can be used for the measurement of carbon dioxide in the liquid phase. Unlike NDIR detection, this method displays an extremely stable calibration and is not susceptible to considerable drift over time. This means that the TOC analyzer can be calibrated less frequently without compromising on analytical performance. Direct conductivity and membrane conductivity are the two types of conductivity detectors. Direct conductivity detectors provide simple and inexpensive CO2 measurement, using no carrier gas. They suffer from an analytical range limited to parts per billion measurement, and are also susceptible to interference from ionic contamination, halogenated organic material, acids, and bases. Membrane conductivity detectors are more robust than direct devices, with a wide analytical range for both deionized and ionized water samples. In membrane conductivity, the membrane forms a protective barrier to interfering ions, enabling the exclusive analysis of carbon dioxide. This method suffers from a slow analysis time and is also prone to ‘false negatives’ due to the membrane acting as a site for secondary chemical reactions. Non-dispersive infrared (NDIR) cell detection measures carbon dioxide in the gas phase. It is a direct method that specifically measures carbon dioxide by analyzing the absorption spectrum in the IR region. Static pressurized concentration (SPC) is a new NDIR technology. In this method, the detector is pressurized. Once the gases contained in the detector reach equilibrium, carbon dioxide concentration is analyzed. A TOC analyzer that utilizes this process measures all of the oxidation products contained in the sample in a single reading. One of the most important specifications provided for total organic carbon (TOC) analyzers is the measuring range. Accuracy, resolution, and analysis time are important as well. 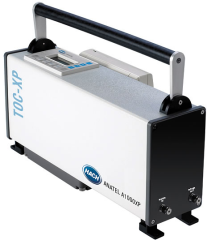 Analytical range is the range of TOC values that a device can analyze effectively. Analyzers with a long range can measure a wider variety of sample types. Range can be specified in mg/L (milligrams carbon per liter solution) or on a parts per million/billion basis. Accuracy determines how much a device’s TOC value may deviate from the actual value. Resolution is the detail of an analyzer’s TOC measurement. A high resolution device may read in the parts per billion range, while a lower resolution device may only measure TOC up to parts per million. Analysis time is the time the device takes to complete a sample analysis. Times may range from minutes to hours depending on the methods used by the technology. Organic carbon – Carbon within an organic compound. Organic compounds are (generally) those of biological origin. Inorganic carbon – Carbon within an inorganic compound. Inorganic compounds are (generally) those of inanimate or non-biological origin. Purging – Removal of gases in a solution or contained vessel by filling and rinsing with an inert gas such as gaseous nitrogen (GAN). Persulfates – Ions or compounds with an excess of oxygen, such as permonosulfate (SO52-). NDIR or nondispersive infrared sensor – Spectroscopic device used as a gas detector. Composed of an infrared light, sample chamber, filter, and infrared detector.